How to Join or Renew Membership: You can join the club or renew your membership at any time during the year by: (1) mailing a check payable to “Blue Ridge Hiking Club” and mailing it to the Club Treasurer; (2) making a PayPal transfer to blueridgehikingclubdues@gmail.com; or; (3) paying the Club Treasurer by cash or check at a quarterly meeting. Dues are $10.00 per year, PER HOUSEHOLD, and are not prorated. New Members: Be sure to include your name, e-mail address, mailing address and phone number with your dues payment. Current Members: Annual dues should be renewed on or before January 1st, but not later than March 31st of the current year. Be sure to verify your contact information when making payment. Contact Information: It is important to keep your contact information, especially your email address, current. Email is the only communications method the club uses to keep members advised about club activities. Any last-minute changes to hikes, such as meeting time or place, will be sent to the email address in our database. Additionally, each quarter a club membership roster and minutes of the most recent quarterly club meeting will be sent to all members via email. Changes or corrections to your contact information should be sent to the Club Treasurer. Hike Schedules: A current hike schedule can be found on the “Club Hike Calendar” tab. There is also a link at the top of the calendar to a printer-friendly hiking schedule for those members who prefer a hard copy. A link to a "real-time map" showing any Blue Ridge Parkway closures is also at the top of the calendar page. To volunteer to lead a hike: Hike leaders are always needed for the Wednesday and Saturday hikes. Each quarter, Hike Coordinators send a list of dates for which Hike Leaders are required. Contact the appropriate Hike Coordinator to volunteer. Then click the “For Hike Leaders” tab where you will find all the information you need to successfully lead a hike. 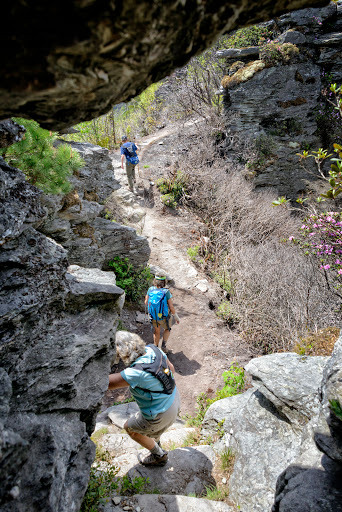 Organizations We Support: Most of our membership dues are donated to organizations that help maintain the trails on which we do the majority of our hikes – Friends of the Blue Ridge Parkway and Friends of the Mountains-to-Sea-Trail and the Middle Fork Greenway. Club Discounts: Members are entitled to a 20% discount on Mast Store Branded items at the Mast General Store.